Category: Supporting Practices: Observances that support and expand developing spirituality. They aren't "slogans to live by": they require setting aside some dedicated time. They aren't "occasional," but call for regular application. Nor are they merely "worth a try," since their value doesn't depend on whether you happen to have a taste for them. from Scott Alexander, "Exercise," in Everyday Spiritual Practice, abridged and adapted. Everyone knows that regular, vigorous exercise offers a wide constellation of health benefits, as well as a general enhancement of personal well-being and enjoyment of life. But what makes it a spiritual practice? A spiritual practice is any regular, intentional activity that serves to significantly deepen the quality and content of your relationship with the miracle of life. 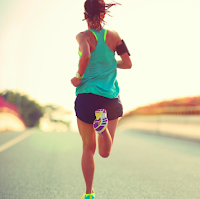 For me, running is a spiritual practice that connects me in deep, satisfying, and enriching ways with myself, other people, my world, and the day. The spiritual aspects of exercise are twofold. First, exercise has meditative and reflective dimensions. Many who exercise regularly report that their physical discipline helps them to achieve a state of mindful and meditative peace and calm. If I relax while running – focus my mind on the regular rhythms of both my breathing and body movements, and let go of the distractions and complexities of my day – I often move into a spiritual state of being fully alive to the rich miracle of life both within and around me. I feel in soul-satisfying harmony with all that is: my body, the natural world, other people, even what I call God. While running does not always bring me to this calming, meditative place, regular exercise can often be a time to meditate, to become more aware of and grateful for life. Second, the regular practice of exercise establishes an overall spiritual “right relation” with myself, my world, and other beings who share it with me. If I care for the body that houses and holds me, I will be more inclined and more able to care for other lives around me. So taking responsible care of your own bodily temple can properly be seen as a primary spiritual practice of care and connection to all the infinite intricacies of reality. Any form of regular, vigorous exercise can be a discipline of spiritual self-care that naturally leads to spiritual other-care, and thus to right relation with all you encounter and touch. For many of us, regular exercise is easier said than done. Only about 20 percent of Americans regularly exercise enough to achieve any cardiovascular benefit. The legacy of mind-body dualism permeating Western thought encourages us to devalue and neglect things we deem merely physical – including our bodies and the earth itself. Human wholeness and health are impossible if we separate the spiritual from the physical in our lives. It is sometimes helpful to have words like “spirit” and “body,” but we must be careful not to let our language lead us to think that these are different things. There is just one reality. Though we occasionally look at it through different lenses – attend to its differing functionalities – we shouldn’t forget the oneness, for this is what connects us to all life and to the holistic mystery that is being itself. The fitness of the body is a fundamental necessity for being healthy, whole, and fully alive. First, refuse to allow yourself not to do it. The most frequently used excuse is, “I just don’t have time,” but we must make time, disciplining ourselves to set it aside on a regular, faithful basis. Your aim, after all, is not just physical fitness but spiritual wholeness itself. Second, begin slowly and appropriately given your physical condition, age, body type, and personal preferences. Making grand (and unrealistic) resolutions is only likely to lead you quit (in frustration and shame) within a week. Build up your exercise routine gradually, allowing both your body and your personal schedule to adjust to these new demands (and delights!) Be sensible and patient – and stick with it! Third, do check with your physician to ensure that your body is ready for the rigors – even if slowly built up to – that you are planning. Every day, almost without exception, I take an hour to tend my relationship with my oldest and most intimate friend – my body, or, rather, my self – for body is self. Noon is my favorite time to lace up a pair of running shoes, do a little stretching and step outside – regardless of weather – for a good, swift run. The daily run is almost always the most enjoyable part of my day. I love the expansive freedom, love noticing the pleasing intricacies and healing grace of the natural and the human worlds: sunlight kissing a passing cloud, a cormorant gracefully diving for a fish, children playing in sand. I love the experience of being so present and alive. And I love the feeling when I have finished – that glow of accomplishment and invigoration – that returns me to my day refreshed, reawakened, and rejuvenated. I am ready and able to meet the duties and demands of my day relaxed, focused, alert, patient, and eager. My regular exercise routine helps me stay in healthy right relation – with myself, nature, other persons, indeed all of existence itself – and allows me to feel truly at home in my body and in the world.